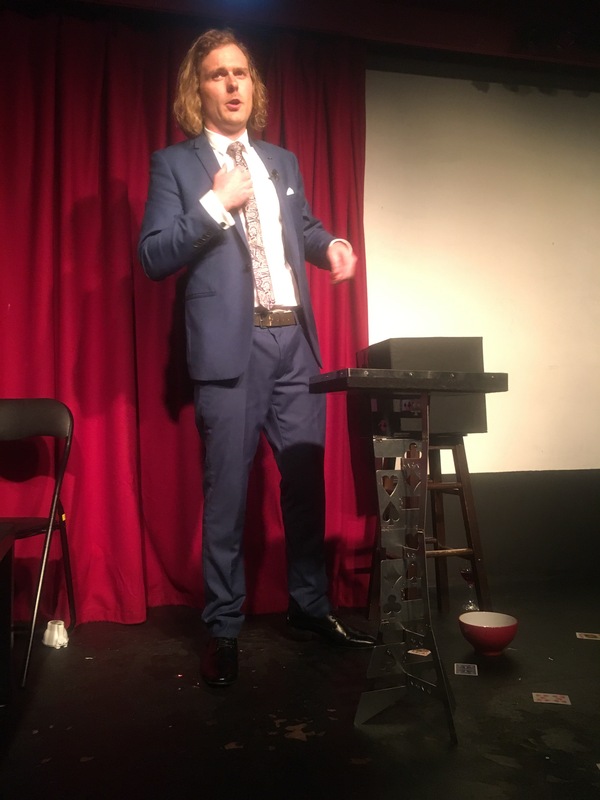 Recently I was lucky enough to attend opening night of Lawson Reeves’ magic show called “Genuinely Impossible”. 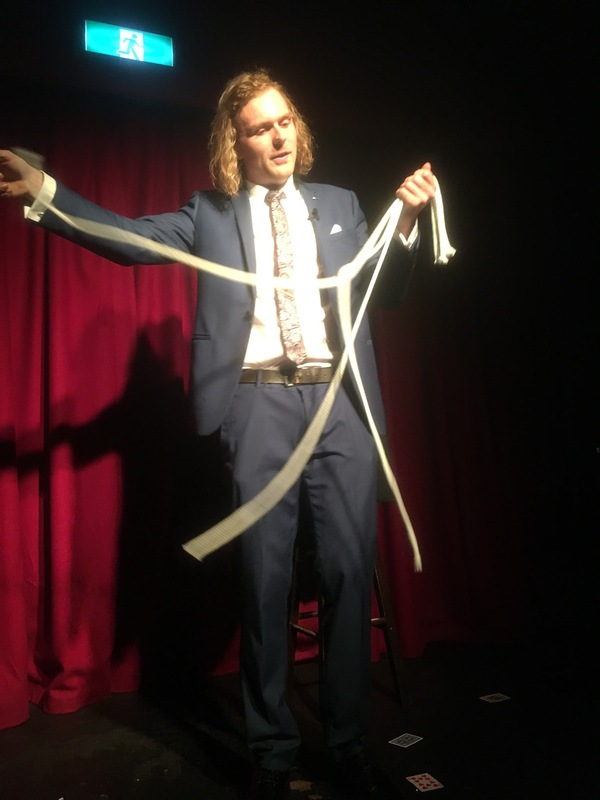 Lawson Reeves is a media identity (and some of you may know him as a past Big Brother housemate), however I’ve never seen him present a solo magic show so I was keen to attend and see what impossible scenarios Lawson could conjure! 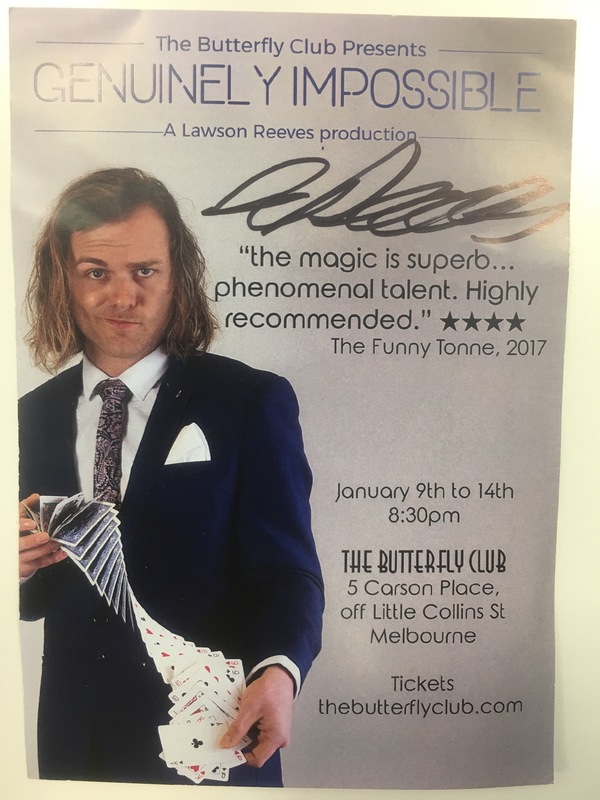 Lawson’s show is at The Butterfly Club – a fascinating and wonderfully well known cabaret club and bar down an alley in the city of Melbourne. I’ve been blessed to visit The Butterfly Club many times, but for those who haven’t I heartily recommend a visit. Aside from the very welcoming box office and bar staff, there are all manner of curios and antiques lining the walls and bookcases within the club – it’s like a feast for the eyes before you even reach showtime! Legend has it that many past performers have donated items to be displayed on shelves, so there is plenty to marvel at pre (and post) show. The audience was excitedly taking their seats, and the group of people next to me were especially eager to see the show. I find this excitement and enthusiasm always adds to the show atmosphere. 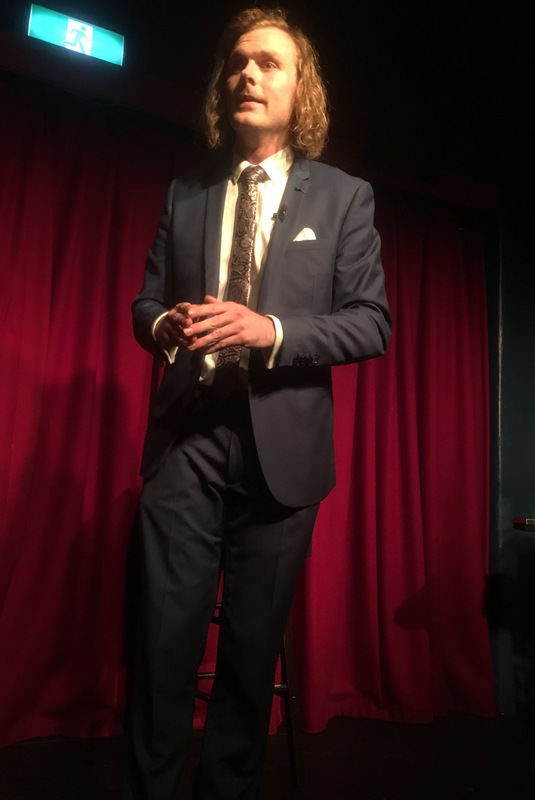 With impeccable comedic timing, Lawson made a surprising entrance on stage and commenced the show with some comedy magic which the audience enjoyed. 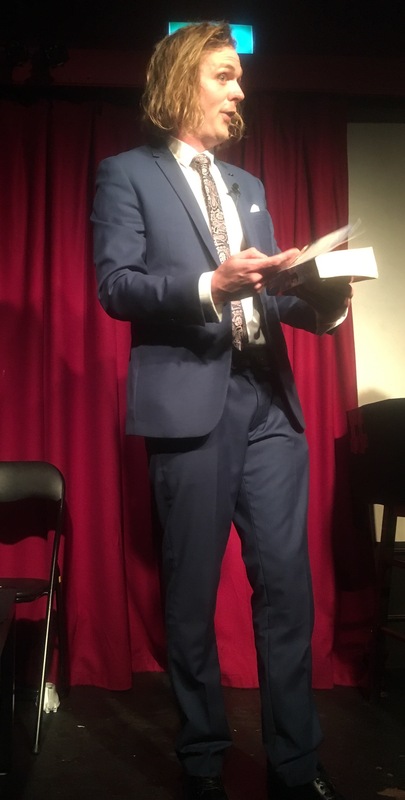 Lawson mentioned early in the show that his show isn’t a traditional magic show, and he is right – you’ll find no rabbits in top hats, stuffy tuxedos or cliche assistants here. 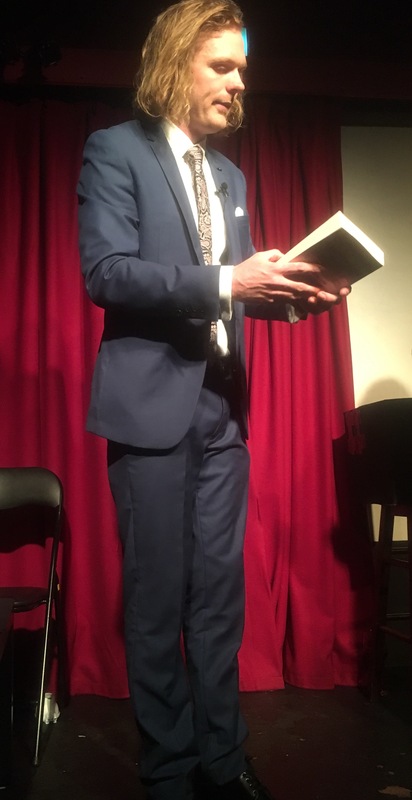 Instead, Lawson uses well timed wit, some choice props and his (often cheeky) humour to enhance his modern takes on magic. 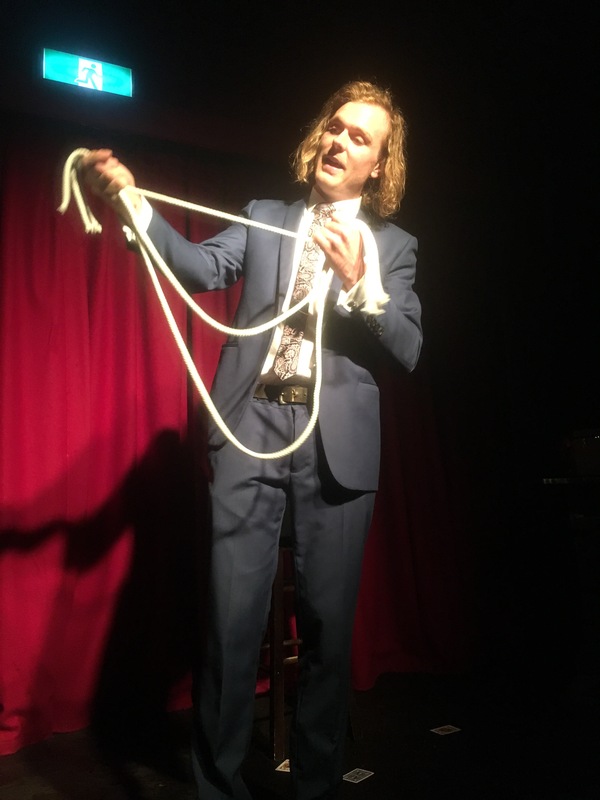 You may be wondering what kinds of magic to expect in Lawson’s show….without giving too much away, Lawson does perform some fantastically entertaining card and rope magic, along with some predictions and finale which truly has to be seen to be believed! Vanish any thoughts you may have about such magic, as Lawson’s magic is so surprising that you just do not know what to expect while watching his show and I find that thrilling. Throughout the show, the audience had no idea what was going to happen next, which lead to many gasps of surprise and much applause! An aspect I thoroughly enjoyed about this show is that it is very light hearted. Lawson clearly doesn’t take himself too seriously and that worked so well during his show – it brought extra laughs and enjoyment to the audience, it made the audience relax a little more and enhanced the entire show for everyone. I was impressed that all this was achieved without compromising or cheapening the magic, which remained exceptional. ‘Genuinely Impossible’ is a show where the comedy shines as much as the magic. Genuinely Impossible and Genuinely Entertaining, Lawson’s show had the audience laughing and clapping throughout as well as a very mystifying finale. What more could one want from a magic show? I enjoyed myself so much that in what seemed like no time the show was already over, leaving myself (and many other audience members I’m sure) wanting to see more. VERDICT: I really can’t recommend this show enough, ‘Genuinely Impossible’ truly has something for everyone (though perhaps not suited to children!). 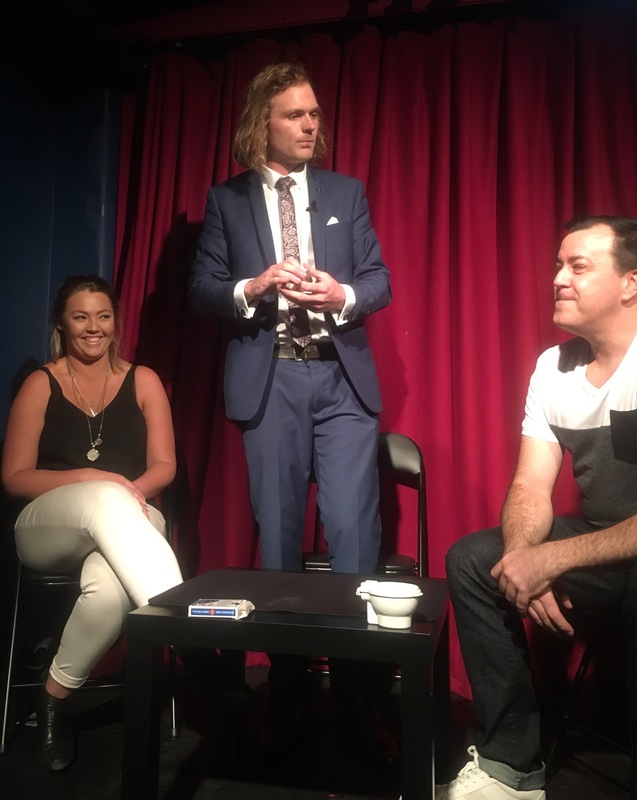 Those who crave comedy with their magic will be satisfied and those who seek magic with modern twists will be surprised and delighted by ‘Genuinely Impossible’ – a show which lives up to its name.